The MZ056F electrical swivel joint uses fiber brush technology which offers several advantages over conventional slip ring contacts including multiple points of contact per brush bundle, low contact force per fiber and low contact wear rates. In addition, fiber brushes do not require lubrication and produce virtually no wear debris, for maintenance free, life time operation. MZ056F series electrical swivel joint is a general name for those rotor flange slip rings with OD(outer diameter) 56mm. 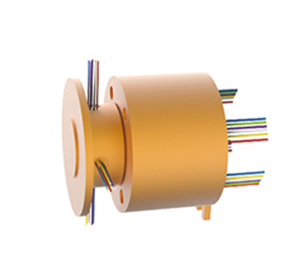 This slip ring is solid without through bore, which is suitable for end face mounting by rotor flange. A electrical swivel joint can be used in any electromechanical system that requires unrestrained, continuous rotation while transferring power and/or data from a stationary to a rotating structure. A electrical swivel joint is also called a rotary electrical interface, collector, swivel or a rotary joint. A electrical swivel joint can improve system performance by simplifying operations and eliminating damage-prone wires dangling from movable joints. If you have special requirements for MZ056F electrical swivel joint, please contact customer service. MOFLON supply build-on-request service base on MZ056F series, the delivery time of build-on-request is 2 weeks,and price is only 10%~30% more than the standard version. if order MZ056F with 65wires*signal,the model should be MZ056F-S65.